[00:09:13] <gezar> how have things been with emc lately yall? [01:55:17] <maddash> I don't get it -- why is it so hard to find the clock cycle per instruction of the MIPSM4K core? [01:59:26] <maddash> SWPadnos: were you being sarcastic? [01:59:53] <JymmmEMC> SWPadnos: Eh, too bad I didn't toss insurance on it, couldn't had a nice shiny new one. [02:00:52] <JymmmEMC> SWPadnos: Oh, and the packing in the box is expensive, so you owe me one for that! [02:02:23] <maddash> wtf is this? some anti-assembly programmer conspiracy? [02:04:44] <gezar> well your asking about instruction timming right? [02:04:47] <maddash> maybe for RISC processors the clocks needed to execute each instr is fixed? [02:05:35] <JymmmEMC> SWPadnos: Huh? Two dinners? [02:05:55] <fenn> jymmm why not just chop up a cord and solder to an IEC socket? [02:06:09] <maddash> SWPadnos: aren't the numbers supposed to be designed, not predicted? [02:09:21] <JymmmEMC> SWPadnos: Not the bubble packs! [02:09:35] <JymmmEMC> SWPadnos: the walmart grocery bags were very expensive! [02:16:07] <SWPadnos> what length extension are you looking for? [02:16:56] <JymmmEMC> dont go out of your way or anything. It's just a want, not a need. [02:19:47] <maddash> haha, puny avr! [02:22:38] <SWPadnos> a long screwdriver? [02:22:45] <JymmmEMC> damn recessed screws be damned! [02:23:18] <SWPadnos> the real question is - should I have a glass of milk and a raspberry filled cookie before going to bed? [02:25:02] <SWPadnos> do you have one of the ones that has a sheath that slips (so you can hold it)? [02:26:18] <JymmmEMC> anyone have/thinking about a greenhouse? [02:30:34] <maddash> any avr32 plug-in modules comparable to microchip's http://www.microchipdirect.com/ProductSearch.aspx?Keywords=MA320001 ? [02:57:00] <scutsxg> yeah,you give us a good toy 5axisgui. [03:00:29] <cradek> I don't think I have the gcode that made that video anymore - do you have a question about how to program emc in 5 axis? [03:34:41] <Guest331> When I use axis to operate a lathe it shows an "A" axis which I assume is the spindle feedback, how do I set it to not show that information? [03:38:16] <Guest331> what is A? [03:48:26] <tomp3> the ini file 'AXES = 3' followed by 'COORDINATES = XZ' may be a bit confusing, its a way to skip the 'Y'. what config did you use to get an A axis? [05:08:34] <spasticteapot> Is there a tool I can fit to a drill press that will allow me to drill holes around the circumference of a piece of pipe? [05:09:07] <spasticteapot> Alternately, is there anyone here with a 4-axis CNC router that I can easily bribe? [05:33:17] <toastyde1th> spasticteapot: a v block and a vise? [05:35:03] <spasticteapot> I was thinking of something that I could rotate with a crank. [05:35:32] <toastyde1th> a rotary table? [05:35:35] <toastyde1th> but those are money. [05:36:11] <toastyde1th> that looks done via rotab for sure. [05:39:08] <toastyde1th> but i guess with some finesse and care you could do it on a drill press. [05:39:08] <spasticteapot> I might be able to borrow one. [05:57:01] <spasticteapot> Anyone here got a 4-axis router they'll whore out for cash? [12:27:09] <rayh> Hey skunkworks. You want to answer that or want me to? [12:46:36] <rayh> How you doing? [12:48:01] <skunkworks> Good - have the leaves all changed up there? [12:48:59] <rayh> Fantastic year. They are falling but it is still very nice. [12:49:26] <skunkworks> it seems to be ramping up here. [12:49:43] <skunkworks> asian beatles are in peak right now. [12:54:43] <rayh> Ah. Not many around here this year. [12:58:45] <rayh> Hi Alex. I'll include that thought in the post although I think he wants to not even type sudo. [13:03:55] <archivist> bah coffee boy gone out /me waits! [13:04:49] <skunkworks> if all else fails - I can walk down to the plant and get a cup. [13:14:48] <rayh> I don't think the presence or absence of coffee affects my assholeness. [13:18:23] <rayh> oh that makes my day! [13:18:36] <rayh> Catch you'se guys later, 'eh. [13:19:02] <rayh> Thanks for the sudoers thought, alex_joni. [14:06:22] <tomp> i tested a pc with nv and with vesa, didnt see a benefit. and vesa only allowed 800x600. [14:28:15] <anonimasu> "My private networks are protected by commercial grade firewalls at each public entry point, linked by site-to-site VPN." [14:29:26] <anonimasu> I love windows users. [14:58:44] <skunkworks> sounds like a good plan..
[15:06:32] <pjmmm> archivist there is a HDD at the hursley computer museum that has the head moved my a pnumatic thing! [15:17:34] <tomp> so they loosen the nut when moving fast & snug it up when slower (or stopped ) ? [15:36:16] <anonimasu> stuff off the part I made at work..
[16:04:49] <anonimasu> there's 4 toolchanges for thatpart..
[16:05:40] <anonimasu> it's a valve block for some huydralics..
[16:06:01] <anonimasu> and the surface was ok.. not really great..
[16:15:10] <anonimasu> it's too bad the customers that ordered it will probalby weld it in place. [18:57:40] <fragalot> the "enable" pin on my L297 is just EMC2's "Amplifier enable" pin ,.. right? [19:08:57] <anonimasu> I want a lathe that size..
[19:08:59] <cradek> maybe I'm dumb but what's the big wheel for? [19:09:00] <anonimasu> with a MEGA gearbox..
[19:09:24] <cradek> oh varispeed change? [19:16:01] <anonimasu> and remember to take out the key. [19:16:47] <awallin> so it's a variable ratio belt drive? [19:23:52] <tomp> ? carbide for brass & alum ? [19:46:49] <SWPadnos> isn't the screw the slightly higher horizontal bar? [19:49:10] <SWPadnos> oh, so those are both guide rails? 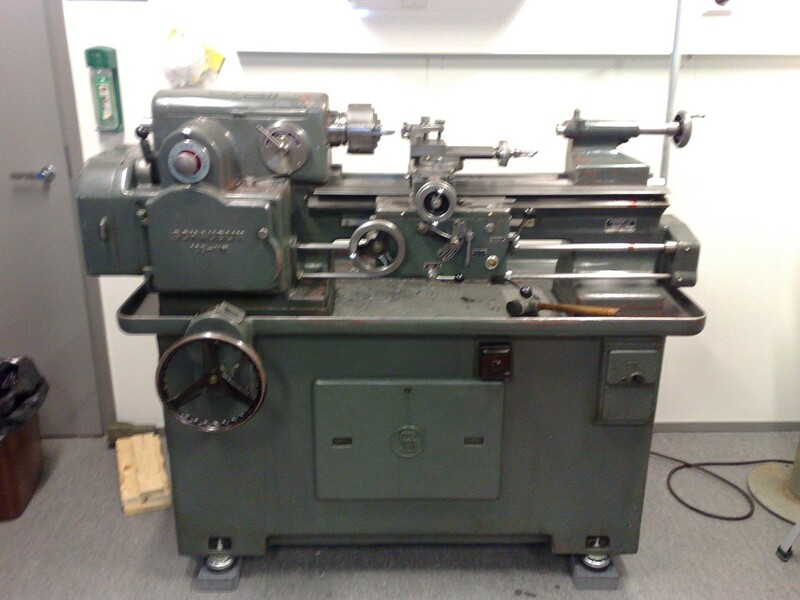 [19:49:52] <SWPadnos> this is how much I know about lathes: ""
[19:59:42] <stuste1> Looks like a very nice lathe. I like the variable speed on it. Appears in good shape and well taken care of. [23:47:27] <JymmmEMC> Note: When you are playing with a fog machine, pull the battery from the smoke alarms BEFORE hand (but remember to put it back afterwards). [23:52:46] <tomp> is it one of those high voltage mist generators? sits underwater? [23:53:01] <archivist> Dallur seen Iceland on ebay ?